Little readers can learn all about the letter 'Z' with this alphabet puzzle, full of colorful pictures and sight words starting with 'Z'. 'A' is a great place to start learning the ABCs! This simple letter puzzle is a fun, engaging way to introduce your child to the alphabet. Dogs, dolls, and drums, oh my! Your kindergartener will get plenty of letter practice with this delightful "D" letter puzzle. 'V' is for victory, and very fun! Help your child learn some sight words that start with the letter 'V' with this cut-out jigsaw puzzle. A star shines, a snake slithers and a strawberry is sweet! Those words are perfect for learning the letter 'S' in this alphabet puzzle. A cloud, a cat and cheese have something in common: the letter C! Your little learner will have fun learning about "C" with this letter puzzle. A goat, glass and grapes need your kid's help in this great letter puzzle! Piece together this home-made jigsaw puzzle to learn a few "G" words and pictures. The letter "M" is for moon, mountain and mouse! Your little one can have fun reviewing his ABC's with this puzzle that he can make himself. What kinds of words start with the letter 'R'? 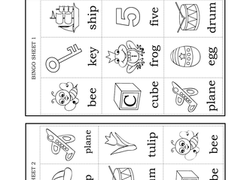 Your little reader can learn sight words as he reviews his ABC's with this fun puzzle. B is for beginning...to read! Help your kindergartener cut out and piece together this simple, colorful puzzle full of "B" words. Help your little learner get ready to read with this colorful letter puzzle. Examine "E" words, with corresponding pictures of an elephant, egg and eye. This "H" puzzle will keep your little learner happy and his mind healthy. Help him hone motor skills by solving this alphabet jigsaw puzzle. Can you think of words that start with the letter 'X'? Give your little reader a review of this tricky letter of the alphabet with a fun puzzle. Kick-start alphabet learning for your kindergartener with this kooky "K" jigsaw puzzle! Your child can practice reasoning skills as he practices his ABC's. The letter 'L' and learning go together! Share this fun alphabet puzzle page with your little one, and he'll get to learn some new 'L' sight words. Here's a fun way for your kindergartener to learn the letter'N. He can cut out an alphabet puzzle, full of pictures and sight words all about the letter N!